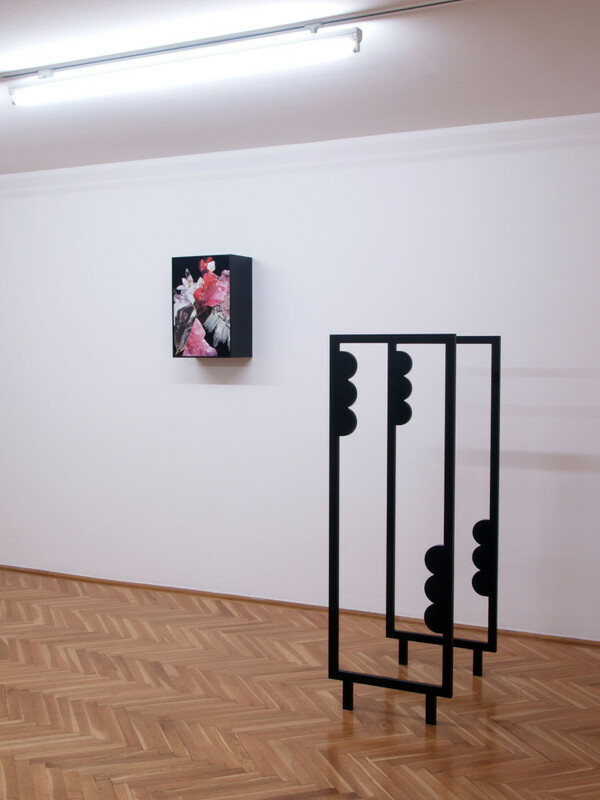 In her collages and sculptures Nicole Wermers relocates the attractions and surfaces of a contemporary consumer culture in architectural structures that hint at the interplay of seduction and control. 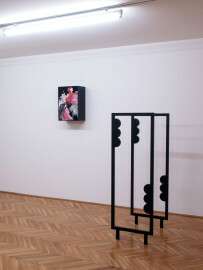 In the Grafisches Kabinett of the Secession Nicole Wermers shows a series of paired abstract sculptures. As architectural systems of guidance they form sluices and passages, while their formal structure brings to the mind electronic article surveillance systems at the entrances and exits of department stores. Nicole Wermers takes these artifacts, which usually have a design factor of next to zero, and updates their sculptural potential. Her choice of materials (wood, steel, industrial PVC flooring, among others) takes up a history of minimal sculpture and modernist surface design. 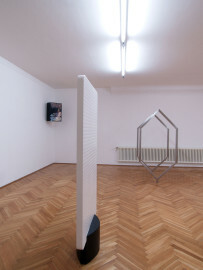 In their flat, reduced form the pieces look almost two-dimensional, while at the same time atmospherically projecting a three-dimensionality that leaves material aspects behind and alludes to a spectrum of invisible radiations and effects—spiritual, of representational symbolism, or electromagnetic. At the same time the twin sculptures also evoke manorial “guardians” to the right and left of portals that regulate the transition between spaces. Thus they dramatize guarded zones of surveillance but also of inquisitive seduction and soundless threat. 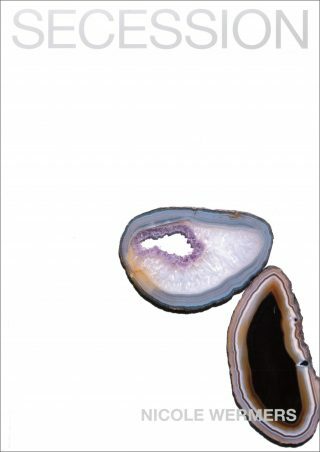 As a further element of the exhibition Nicole Wermers shows a new series of collages related to the sculptures: The collages Katzensilber V–VII (2004) use imagery of crystals, uncut precious stones and minerals. They are presented in box-like frame objects. 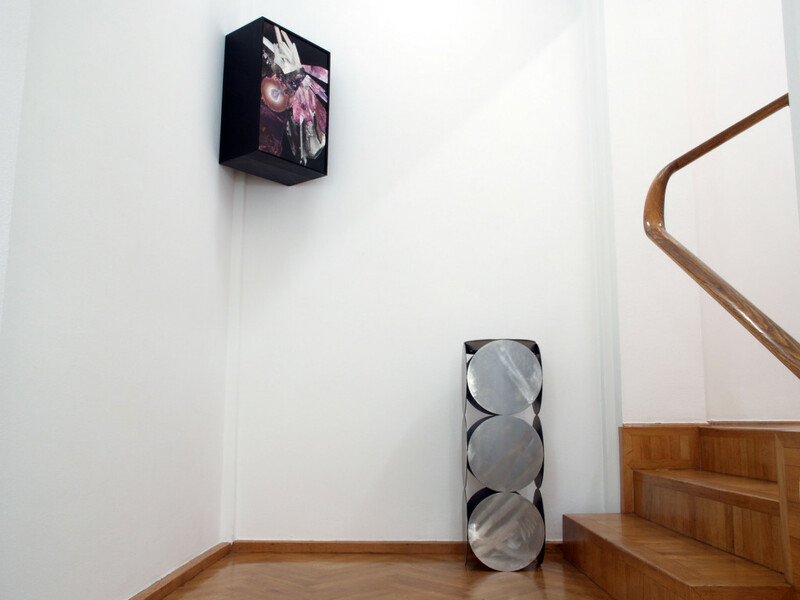 Mounted exclusively on one side the collages give orientation to the rather neutral boxes and “radiate” into the space. 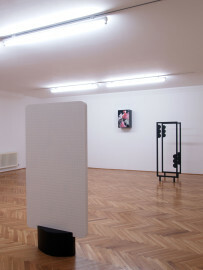 The placement supports this impression, so that the frame objects can also be read as material and immaterial sound boxes amplifying the sculptures. 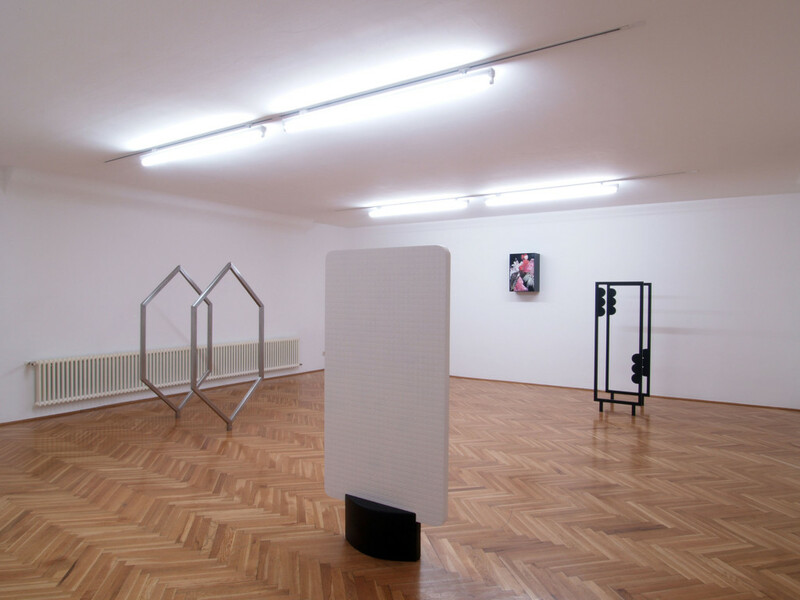 This ambivalently charged energy expands to the staircase leading up to the Grafisches Kabinett, where Nicole Wermers places a steel sculpture. Like in her earlier series French Junkies (2002) the sculpture takes the form of a floor ashtray: An accessory that—like electronic article surveillance systems—regulates consumer behavior, but also contains an auratic moment of seduction. Nicole Wermers, born in Emsdetten (Nordrhein Westfalen) in 1971, lives and works in Hamburg and London.